When we make mobile shredding house calls, we encourage our clients to call ahead and schedule an appointment. This ensures that we allow our customers—and ourselves—sufficient time for a thorough, accurate, completed paper shredding task. Shred Connect also provides our customers with a Certificate of Destruction when the on site shredding or drop and shred job is finished to their satisfaction. This assures our customers that their confidential documents have been completely destroyed and will never be seen by human eyes again. This means our customers will not have to worry about any of their personally identifiable information getting into the hands of a criminal who could easily use this information to steal the identity of them or one of their own clients. So that we may better assist you or your company in making your personal and professional lives run as smoothly and as worry-free as possible, we provide you with free mobile shredding containers that can hold up to as much as eighty pounds, complete with a security lock. Many of our long term customers take advantage of this free shredding services offer because it’s an auspicious beginning to removing all unnecessary clutter from their home and work. You can get your secure document shredding containers today by calling Shred Connect and speaking to one of our happy and courteous staff members. Additionally, if you request three containers or more from our shredding company, we’ll also provide you a personal container for your home and/or office as part of our ongoing mobile shredding services to you. You can never have too many, especially in light of the sheer amount of waste we generate on a daily basis. Whether you are a residential customer or own your own business Shred Connect is only a phone call away and would be happy to help you with all of your paper shredding needs today! 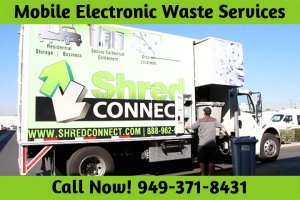 Call us today for all of your mobile shredding needs.